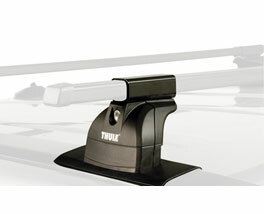 With the growing trend in automobiles coming from the factory with pre-installed attachments for load carriers (called fixpoints), Thule is proud to introduce the new 460/460R Podium foot packs. Two models available for square (460) and Rapid Aero bars (460R). Sleek, modern design for a factory-like fit. Fit Kit required. These kits are designed to be a perfect fit for a specific car model which results in maximum safety andease-of-use.